North Korea introduced its first pair of female pilots of supersonic fighters during a flight drill attended by leader Kim Jong-un, state media reported Monday. 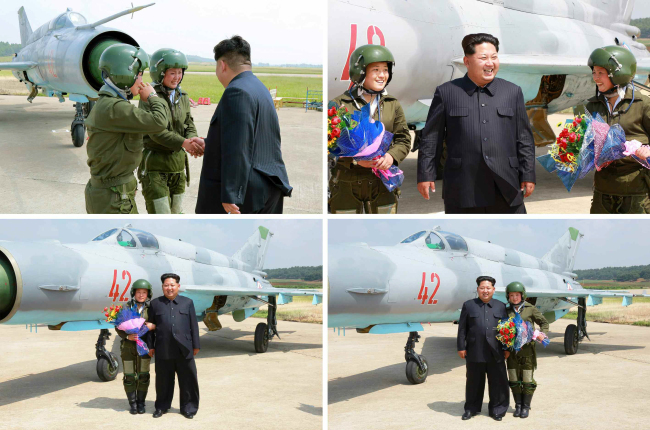 Jo Kum-hyang and Rim Sol stepped into the limelight in November after respectively carrying out a solo take-off and landing exercise with the subsonic MiG-15 chasers, prompting the young ruler to laud them as “phoenixes,” the media said. Kim called for the cultivation of female aviators during a pilot rally in Pyongyang in April 2014, a rare directive in the extremely male-centered society. He had since instructed his aides to teach Jo and Rim the skills to fly hypersonic jets. “They conducted their first solo flight (of the supersonic jet) readily and neatly despite unexpected circumstances,” the official Korea Central News Agency said, without elaborating. The communist country’s female air wing was reportedly launched in 1993, but most of its members have been flying old, propeller-powered aircraft. Among the executives who accompanied the leader were Hwang Pyong-so, director of the Korean People’s Army’s general political bureau, and O Kum-chol, vice chief of the KPA general staff, the agency noted.